Appears in WarioWare, Inc.: Mega Microgame$! Info "You know this one! Donkey Kong is heaving barrels at you, and you'd better avoid them! 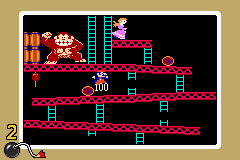 1981: Arcade Game"
Donkey Kong is a microgame in the Nintendo Classics folder in WarioWare, Inc.: Mega Microgame$! It is based on Donkey Kong. The microgame is set in 25m, where Mario stands on the beam just below the top one. Donkey Kong will throw barrels down the beams, and the player must press the button to jump over them. 1st level difficulty: The barrels roll down the rightmost ladder. Mario has to jump over only one barrel. 2nd level difficulty: The barrels roll down the broken ladder. Mario has to jump over two barrels. 3rd level difficulty: The barrels roll down both ladders. Mario has to jump over two or three barrels, occasionally having to jump over two of them at once. Microgames from WarioWare, Inc.: Mega Microgame$! and WarioWare, Inc.: Mega Party Game$! This page was last edited on October 22, 2018, at 14:02.